I have been making prints for about 40 years, and will begin adding a selection from my gallery walls to sell in this space. Please contact me by phone or email for further information on sizing and pricing. 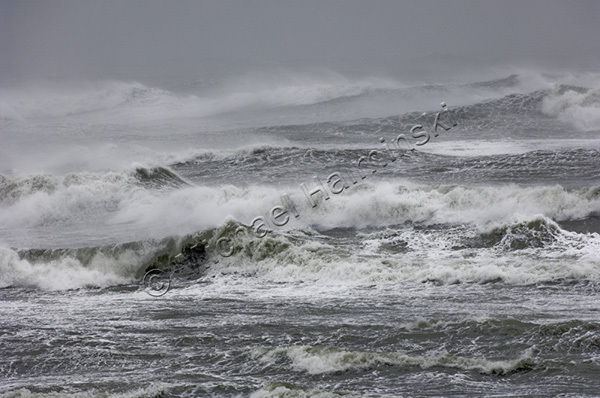 I made this image of the ocean as Hurricane Irene was passing us to the west. It was taken precisely as the wind shifted to the southwest and increased. The gusts were frightening and the sound tide was beginning to flood the villages. Fall is my favorite time of year for light and beauty. Right after Tropical Storm Hanna passed over us and headed out to sea, the surf cleaned up nicely late in the day. Portsmouth Island has always had a special allure for me. I shot this image at sunrise, while shooting a story for Our State Magazine. It was hot that May morning and the mosquitoes were thick. 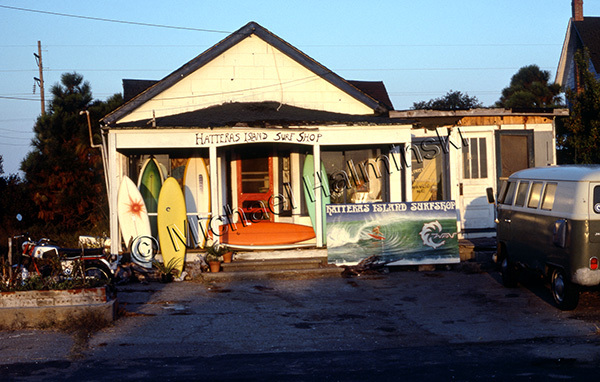 They don’t make them like they used to, and that includes surf shops. It was a bare bones operation that closed whenever the waves got good. I bought the orange board, a 7’6″ diamond tail, for $150, and rode it for over ten years. 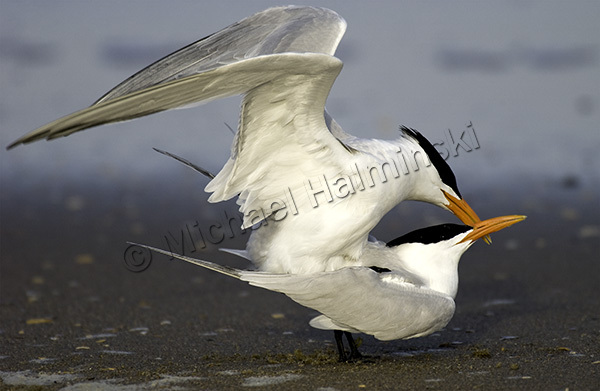 It was in the Spring of the year, and I spotted these terns in full breeding plumage snuggling on an Ocracoke beach. I made numerous exposures, but the crossed bills enhanced this particular shot. I’ve been shooting beachscapes for a long time, and have some particular formulas that I’ve adopted through trial and error. 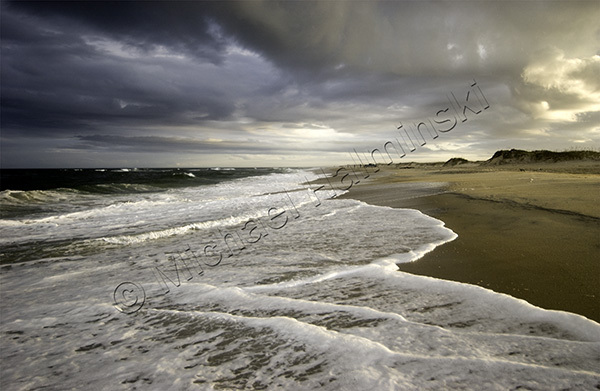 After I bought a 135mm Nikkor telephoto lens, I began using it more and more in my beach and storm work. 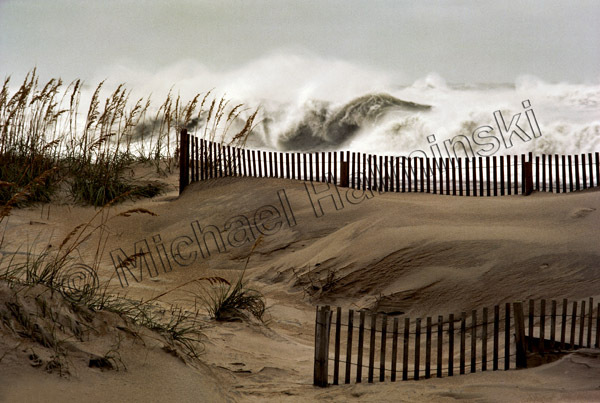 I continue to use it, but I have yet to match this dramatic scene that I made during a northeaster decades ago. 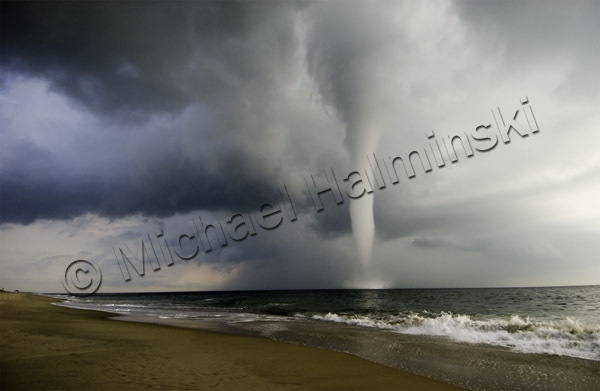 It was a balmy August morning when I saw a waterspout over the ocean near my studio. By the time I got my camera, it was dissipating. That’s when I saw a second one forming to the south. After several minutes this third one followed the same track. 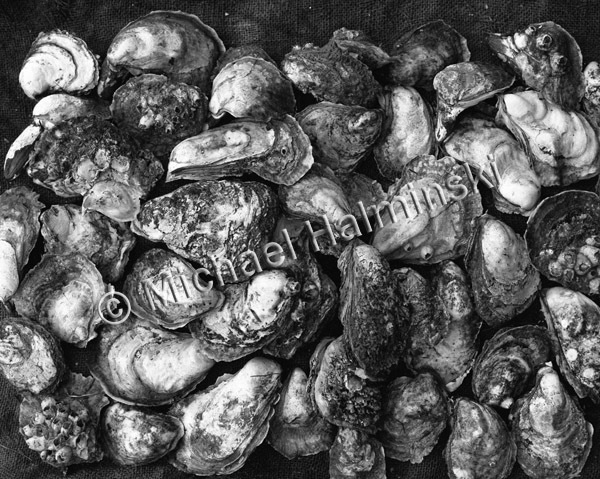 Collecting and growing oysters has become a passion for me. At times, I have to admire and photograph them. This was taken with my Pentax 6×7 medium format camera. They were saved as brood stock for my oyster garden. 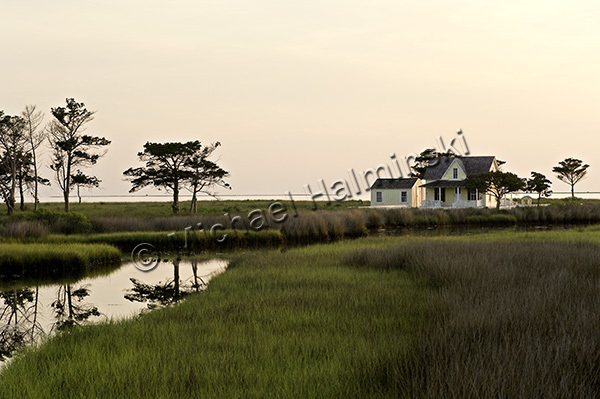 The south point of Ocracoke has been a favorite location for much of my shorebird work. 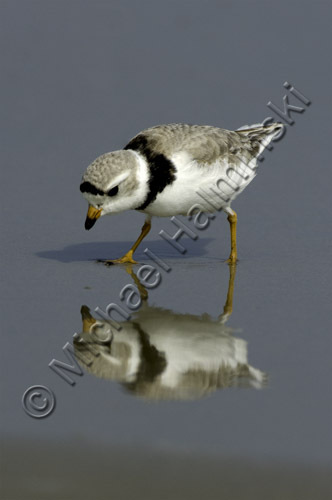 That’s where I can almost always spot piping plovers. This adult male was foraging the flats in fine plumage. 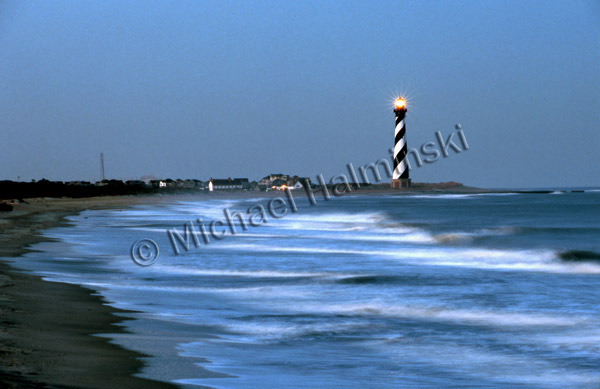 As preparations to move the Cape Hatteras Lighthouse were underway, I was testing a lens on loan from Nikon. Shooting wildlife at Cape Point didn’t pan out, so as I was leaving at dusk, I made several tripod mounted exposures of the lighthouse. The very next day, power to the light was cut off. So as far as I know, this is one of the last photographs taken of the beacon, lit in it’s original location. One of my personal favorite images is a shot taken years ago. After purchasing my first expensive big lens, a German-made 400mm Novoflex, I wanted to shoot birds more than anything. It was May, and some egrets had set up a small rookery on Gull Island. I spent 4 days there, entering my makeshift burlap blind before sun-up. I sat for 6 hours each day, observing and photographing. For an intimate close-up, I was about 12 feet away from this bird, making several hand held exposures with the lens racked-out on a bellows extension. Later the Snowy Egret was used as a cover for the 1985 issue of Outer Banks Magazine, where it won an ADDY Award Certificate of Distinction for Cover Design from Art Direction Magazine. 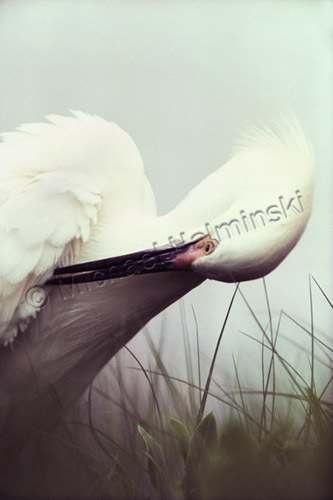 I was driving in the town of Belmar N.J.and this photograph caught my eye sitting at the curb on a chair.I made a U-turn ,pulled up to the picture and there was this most beautiful snowy egret photograph with your signature on lower left in pen and on the back printed aug.1989.waves,N.C.The photo is in double mat and there was plastic over it.The photo has some small area’s that have been ripped.I would like to repair can you tell me what you would recommend.I have always loved all birds they fascinating. As far as I know there is no way to repair a torn photograph. You might be able to scan it and repair the flaws with photoshop and reprint it. Was this photograph being sold in a yard sale or flea market? I also wonder if the photo has degraded by fading. If it was kept away from sunlight it may be alright, but I have my doubts. In case you are interested, I have digitized this image and sell it as a new print. Thank you for commenting and let me know if I can be of further help.